Follow us and discover Athens most beautiful districts with the best way… walking! One of the best routes you could do is that from Syntagma to Gazi. Your walk will begin in Syntagma Square, then continues west down Ermou Str. and through Monastiraki you will pass Psyrri to finally end your walk in Gazi. You will have company all the way as you will follow a very popular area for residents and tourists. Starting from Syntagma metro station, you will see the Parliament, the tomb of the Unknown Soldier and the whole square which is hosting celebrations, massive protest rallies and major historic events. In front of the square you will find Ermou Str., a very busy commercial road, which was pedestrianized in the 1990s. There are many stores, but the shoe shops are incomparable, you'll definitely find lovely pairs at this specific area. Right on this street you will see a churming church dating from 1050. It has typical Athenian style domes. It was dedicated to Virgin Mary and its known with the name Kapnikarea. Just a block beyond the church you will find Aeolou street. Walk left for 2 blocks and you will find the Tower of Winds. Don’t follow the road all the way, you must turn right to Pandrossou Street. This pedestrian alley was a Turkish bazaar. Now it is a flea market where you can find souvenirs and jewelry shops. At the end of Pandrossou Str. 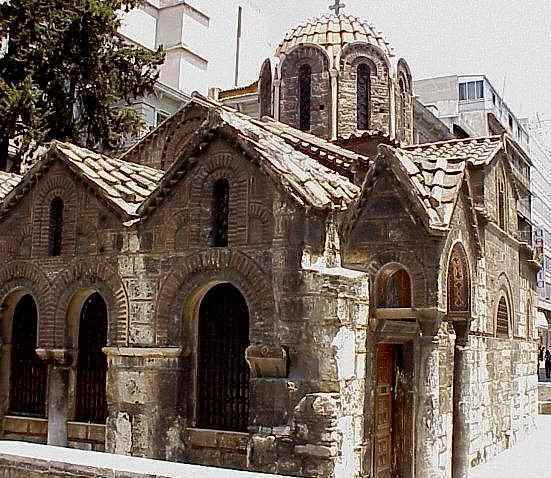 you will find at one of Athens former mosques, Tzisdarakis Tzami. It was used as a prison before being converted in 1918 to a museum, now it is the Ceramic Folk Art Museum. Now you've reached Monastiraki Square, in front of the homonymous train station. Stop there for a coffee or a souvlaki at one of the many café – restaurants, while you can also get a very nice view of the Acropolis over the Ancient Agora. On the west side of the square you will find Ifestou Str., an alley full of shops catering to youths (boots, shirts, military clothes etc), and if you are a flea market lover you are in the right place. Follow Ifestou str. for a few blocks and you will find Abyssinia Square also known as Paliatzidika (second hand shops), where every Sunday you can find a huge variety of household goods. Continue west until you see Ermou Str. again and then follow west for several blocks and you will reach Kerameikos area. Located in what was the pottery district of classical Athens. Not so well known site but very interesting indeed. From there get back on Ermou, follow that a block until Piraeus and turn left, on your right you will see Technopolis complex in Gazi district. Lovers of industrial design will appreciate the place as it is converted gasworks. It often hosts concerts, exhibitions and there is café on site.